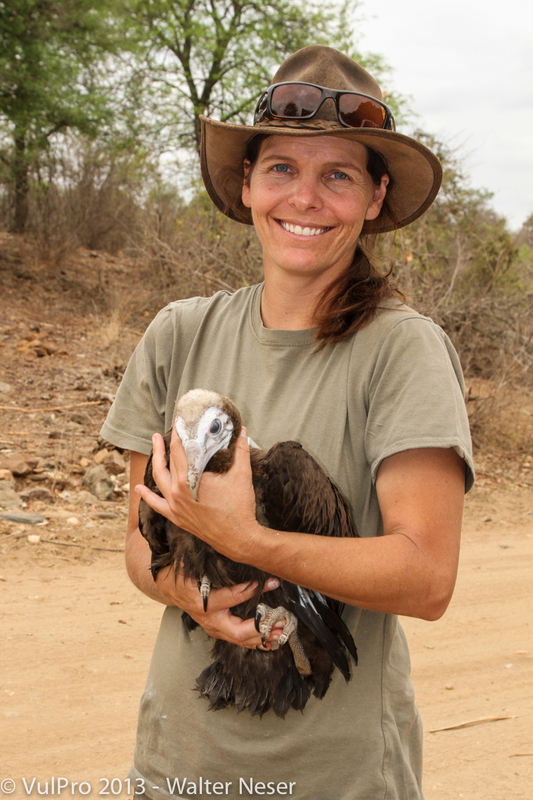 Kerri with our first Hooded Vulture from South Africa. 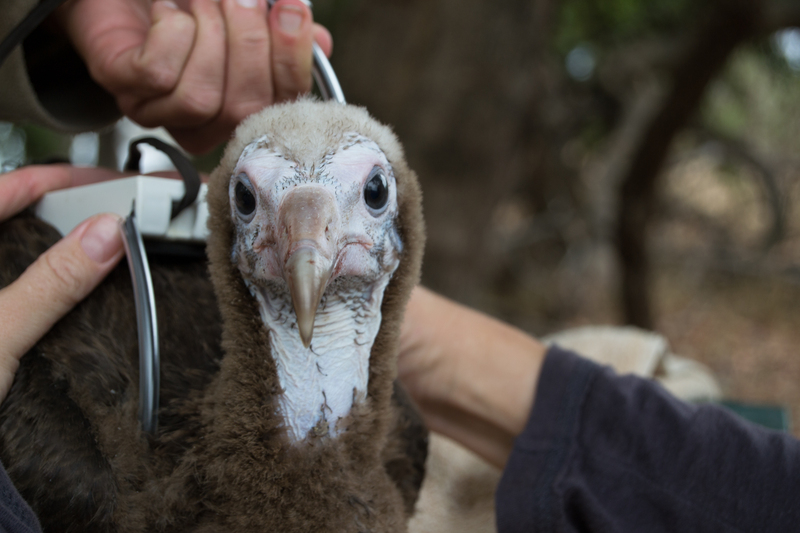 With the bulk of our work at VulPro (www.VulPro.com) involving large species of vultures, when Keith Bildstein contacted us about collaborating with Hawk Mountain on a project involving South Africa’s smallest, the hooded vulture, we were quite excited about doing something a little different. It also presented the opportunity to learn about a lesser-known species, and we quickly said yes. Time constraints and distance from the field site in northeastern South Africa made it impossible to do reconnaissance field work before tagging, and we were concerned about finding four climbable nests with suitably-aged chicks for fitting the tracking devices. With that, the timing of our weekend visit to the Lowveld Region where the birds occur in South Africa was a bit of a shot in the dark. Working in a big-five reserve adjacent to the Kruger Park has its perks, and during the drive in we were treated to sightings of giraffe, zebra, and several species of antelopes. Upon arrival, we were greeted by Mario, the park warden, who told us about a nest 300 yards from his office on the bank of the Olifants River. We opted to check that first. As we walked over, we quickly saw the nest contained a good-sized chick, and quickly returned to the office and our vehicle to grab climbing gear and camera. Just a few minutes after returning to the tree and with one climbing spur on my foot, Kerri pipes up. I was not too surprised or concerned, and figured it would likely pass by, but suggested to Kerri that she get up the tree as a precaution. As it approached, it became evident it was unhappy with Kerri’s being there. 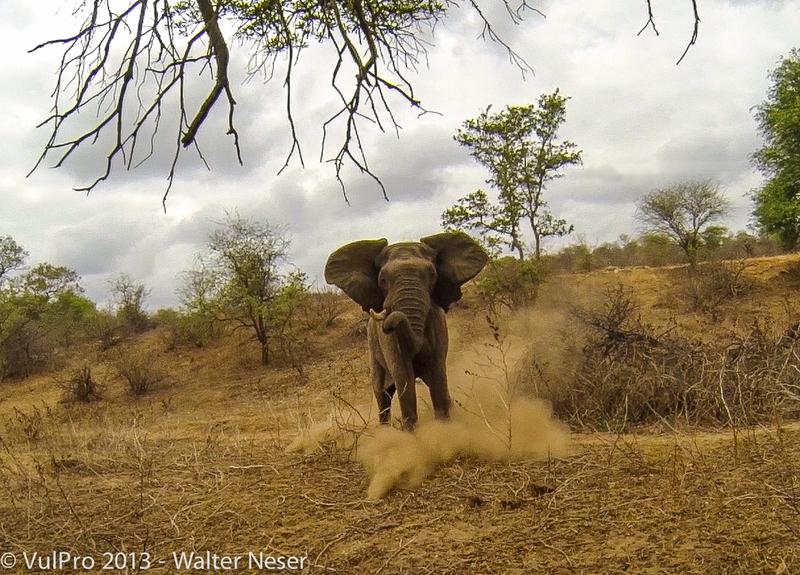 Elephants hate Kerri, and this one must have recognized her.When it was about 15 yards away, it gave a mock charge and I stopped putting on my second spur to shout at it and to keep the GoPro camera focused on the action. The young bull (in must), appeared irritated that there was this obstacle (me) on the ground between him and the now “treed” Kerri, and it gave a second charge, this time trumpeting and kicking up a bunch of sand and dust into the air to try to shoo the pesky obstacle (me) away. e was about to join the chick in the nest. I was high up in the tree already, and opted against letting Kerry know not-to-worry, as whatever happens I will be alright. Luckily this “obstacle,” as Kerri now refers to them, passed without incident. With the nestling down we began to process our first hoodie chick on the tailgate, without additional incident, and returned him to the nest shortly thereafter. The rest of the weekend was spent walking the river banks searching for and plotting nests, climbing the ones that looked active, and processing the suitable-sized chicks, noting which others would be suitable on a subsequent visit. Perks included several sightings of Pell’s fishing owls, and a few hippos and crocs. Walter returning the first nestling to its nest. 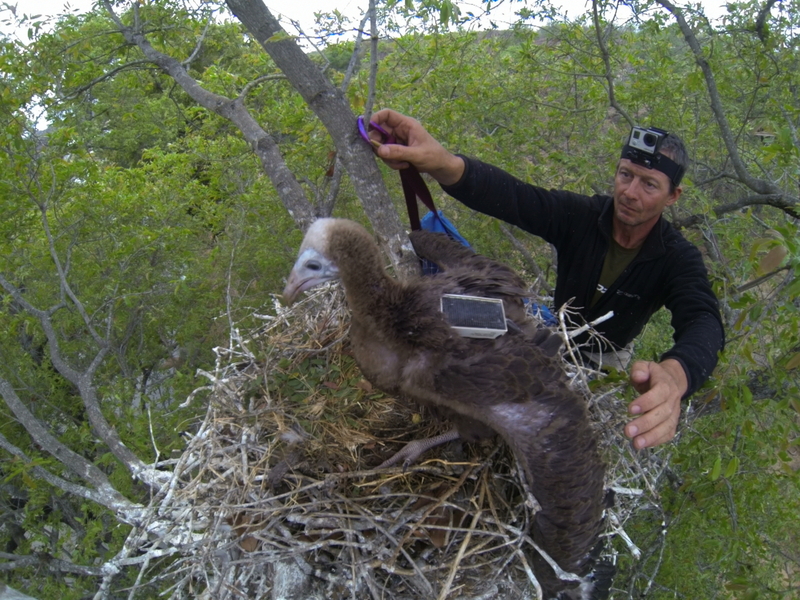 At the end of the weekend we had managed to deploy three of the four tracking units, as well as to map eight hooded vulture nests and 15 white-backed vulture nests. We departed happy, and plan to return in three weeks to deploy the final device. Keith has promised to join us for additional field work in December.